Staff cuts and budget reductions across media outlets, coupled with the shift to online news, has lead to greater demands on journalists’ time and energy. A media survey was conducted by news distribution service PRNewswire in order to get a grasp on the current state of media and trends that are shaping the industry. A total of 1,568 traditional and non-traditional media along with 1,670 public relations practitioners were polled. Over 70 percent of respondents indicate a heavier workload compared to last year. The primary cause of that workload increase was the need to contribute to online reporting. 37 percent of U.S. journalists now must also maintain a Twitter feed. The majority of the U.S. (52 percent) and Canadian media (60 percent) think that building a personal brand is an “extremely important” or “important” consideration in their work. The majority of bloggers (52 percent) view themselves as journalists. While 91 percent of bloggers and 68 percent of online reporters “always” or “sometimes” use blogs for research, only 35 percent of newspaper and 38 percent of print magazine journalists suggested the same. 64 percent of bloggers and 36 percent of online reporters use Twitter as a research tool. 74 percent of PR professionals consider email to be the most effective means for pitching journalists. 43 percent of journalists report having being pitched through social networks. In both the U.S. and Canada, pitches through a social network resulted in coverage approximately 70 percent of the time. The current issue of industry trade magazine PR Week contains a full review of the survey results. 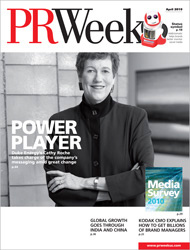 Image of PR Week front cover used under Fair Use: Reporting.